After listening to feedback from teachers, we have updated the Listening Homework Stamp!! ★ I’d like a stamp without an ink pad (one that I can use one-handed). ★ It’s hard to get a clean impression. A Shachihata-type stamp would be better. 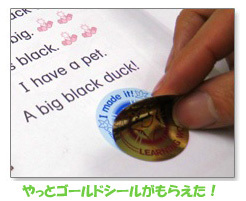 Based on this feedback, the NEW “Shachihata” Listening Homework Stamp is now available! 1. Stamp is pre-inked! So you don’t need to use a stamp pad any more. 2. It’s easy to stamp! 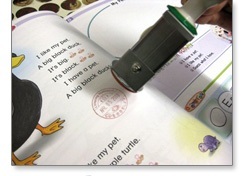 You don’t need to use as much force to stamp the page. 3. The year can be changed separately, so you can get many years of use! 4. Ink is super easy to refill! Use with stickers of the same size (sold separately) to show homework assigned & completed! 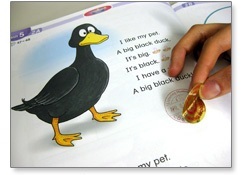 Stamp the page with the listening homework. 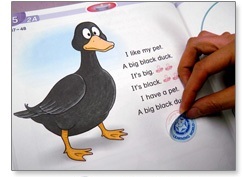 At the beginning of the next class, check and see if students can do the chant, dialogue or song. If the student does an okay job, but not great, put a blue award sticker (sold separately) over the stamp. * If they cannot recite the listening homework at all, you can put a second stamp in their book and assign it again!